A few years ago I was asked to prepare a year 13 class group to receive the Sacrament of Reconciliation. I began by asking how many considered themselves to be sinners. A couple of hands went up including my own. I then asked again explaining that my question was a serious one adding that I was a sinner and so were all my friends. A few more hands were raised. For the next half hour I explained that we are created by God for abundant life, but sin takes over when our fears lead us to grasp at what is immediate and unsatisfying. I explained that the Sacrament of Reconciliation enables us to experience love and mercy in the parts of our lives where we most struggle, and that this is a beautiful experience both in a human relationships and even more-so in our relationship with God. I concluded commenting that we are sinners, all of us, much more than we think we are. But our sin, while a great problem for us, is no problem for our loving and merciful God as long as we acknowledge our sin and turn back to God. The teacher did not understand that self-esteem is not a human achievement. Healthy self-esteem is the fruit of knowing that we are loved even as imperfect, weak and vulnerable sinners. We know Jesus to be “saviour” and if we think we can save ourselves then we have no need for Jesus. Those who experience no need for salvation will see Jesus as just another wise teacher among many and faith in Jesus who is the saviour will mean nothing at all. Even the Pharisees who considered themselves to be living by the letter of the law were silenced when Jesus invited the one of them who was without sin to cast the first stone. Our sin, when we acknowledge it and confess it, becomes a privileged place of encounter with God. Make plans this week to set time to go to confession. You may not have been for twenty or more years, but this is no problem. Just do it! I guarantee that afterwards you will be delighted that you took the step. “I believe nothing can happen that will outweigh the supreme advantage of knowing Christ Jesus my Lord. For him I have accepted the loss of everything, and I look on everything as so much rubbish if only I can have Christ and be given a place in him. I am no longer trying for perfection by my own efforts, the perfection that comes from the Law, but I want only the perfection that comes through faith in Christ, and is from God and based on faith. All I want is to know Christ and the power of his resurrection and to share his sufferings by reproducing the pattern of his death. That is the way I can hope to take my place in the resurrection of the dead. Not that I have become perfect yet: I have not yet won, but I am still running, trying to capture the prize for which Christ Jesus captured me. I can assure you my brothers, I am far from thinking that I have already won. All I can say is that I forget the past and I strain ahead for what is still to come; I am racing for the finish, for the prize to which God calls us upwards to receive in Christ Jesus”. 16 Responses to "a new deed"
However I do think that if the church hierarchy were to seriously investigate why the use of the confessional has declined, they might be surprised at what they might find. I my 75 years as a Catholic, I cannot ever recall being asked why I think the decline has occurred, but I certainly know why it did for many years for myself. Fortunately this has now ended. How wonderful Michael to read your words. I had the privilege of being in Motueka last night for the vigil Mass. After Mass we were invited to join together to discuss reconciliation. A lot of people remained and we had a honest and fruitful discussion. It allowed me to speak to what I allow to get in the way of attending reconciliation. The discussion will be considered by the priests and leadership team to inform change, education and ultimately to enable more participation in and access to reconciliation. It was an excellent living example of honest reflection, discussion and encouragement. A privilege to be there. I had this chat with my friend from another denomination who questioned the validity of our confession, I suggested he confess his sin to his pastor but he was very uncomfortable with that, and I think that’s the point as our sin does make us uncomfortable. Thanks for talking about a challenging sometimes unpopular topic Fr John. Mature spirituality points to life beyond death. It insists on going through-not under, over, or around. Thanks very much for this reflection – it has evoked much for me to ponder on. Not just about reconciliation, but about your story of sinfulness and self esteem. For a while I struggled with the concept of needing to confess to a priest. Surely if I simply acknowledged my faults privately in prayer, and sincerely repented of them, then that would be enough for God, who is infinitely merciful? 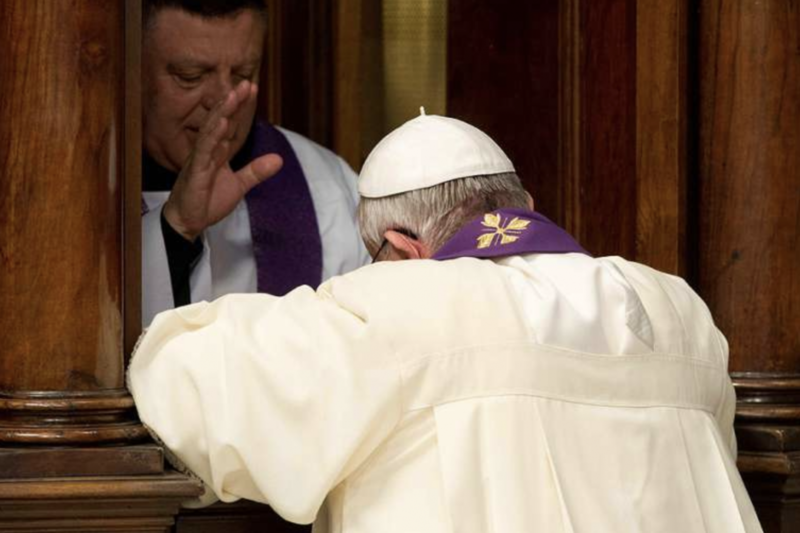 So I read more about the Sacrament of Reconciliation, including its scriptural basis. Jesus told the Apostles, after “breathing on them”: “Receive the Holy Spirit. If you forgive the sins of any, they are forgiven; if you retain the sins of any, they are retained.” Our clergy, with Apostolic Succession, holds this power to this day. Moreover, they can only forgive or retain sins if they are actually heard, an an interpersonal situation, such as the confessional. The problem with confessing privately, within my own prayer, is that I must presume of God’s mercy for me to know that my sins have been remitted. Whereas in the Sacrament, I have a direct promise from Jesus Christ that when the priest absolves me of my sin, I *know* that it has been absolved. Not presumed, but actual knowledge. That knowledge allows me to finally drop my guilt and once again live freely. I don’t think was taught to me all that well in college (I graduated high school in 2008). To this day I still only know of three people my age who go to confession at least semi-regularly (myself, my wife, and another couple our age). Please Father, keep teaching the forgiveness inherent in this Sacrament to our students! It is so important to living in the true freedom that Christ promised, life in abundance. Please pray for me, I intended to go to Confession yesterday cut chickened out. I’ll be praying this week for the courage to approach it again at the next opportunity. I have never liked going to confession. I feel like I am confessing the same sins over and over again that God already knows about anyway, so can’t see the point. I do however, see that for serious sin like murder or something that is really troubling you talking to a priest would be very helpful. We confess our sins every time we go to Mass isn’t that enough? Also I am divorced and living with my partner so am living in sin according to the Church so going to confession is pointless. I talk to God every day and I am happy knowing God loves me and forgives me. I doubt if the teacher in Fr John’s narrative would be a “Spiritual Leader” with that attitude, and may even be aetheistic? Children taught self confidence that is not based on a solid moral basis are like a ship without a rudder – drifting aimlessly through life, with the rocks hidden in the fog. I feel this is the free thinking that is behind what is wrong with society today. 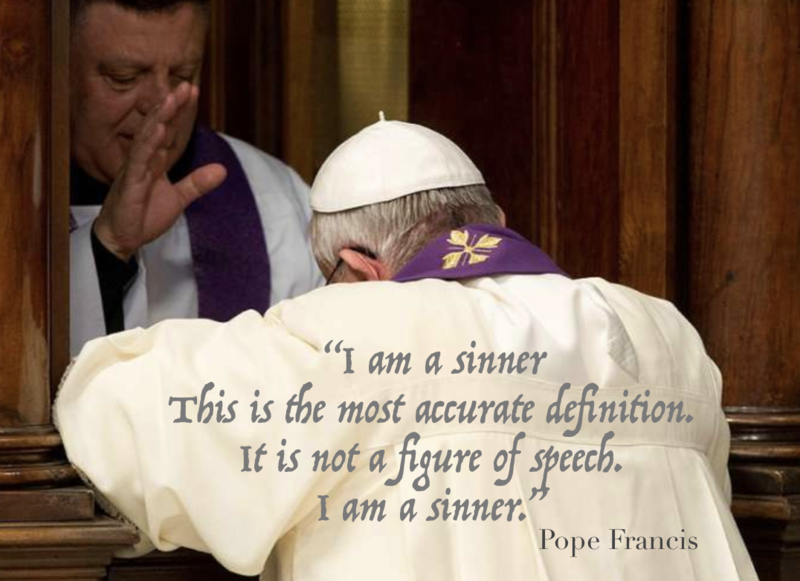 There is something about hearing the words ‘I absolve you from your sins….’. that is so good. It becomes more real when heard out loud. It sort of breaks into this reality. It bridges the relationship between me and God. Well for a while anyway. I am getting lots out of everyone’s comments, and can total relate to chickening out. Thank you Father John so good to hear you speak so encouragingly about the Sacrament of Confession – the forgotten Sacrament – and about the fact that we are all sinners in need of God’s forgiveness and loving mercy. Your reflections are very much appreciated. I visited another church in a city parish and went to confession there before Christmas. The priest didn’t know me so I thought that might make it easier go and all went well. Even now as an older person I have to pluck up the courage to go but I think that is the case for many people. I think I need to prepare more for what I want to say rather than worry when I get there. I love the comments and the fact there are more on this than any other reflection this lenten season – it really highlights for me the struggle I have to be truly Christian. I sit with everyone who has commented – but realise that my sinfulness is the biggest barrier to complete communion with God. He is so patient! And I am so naive. I hide from him when I sin, I know that truly. To confess to the Lord through his anointed apostle is my road to redemption. I feel it would be impossible to achieve this by revealing these indescretion through a discussion with another mere sinner, so I get that this needs to be done through the vehicle of the priesthood, through Peter, Jesus rock. Sin is not an ordinary act of carelessness but an inordinate act of betrayal, a knife in the back, a lance in the side. How does God react to this? An extraordinary act surely invites an extraordinary response? That extraordinary response is an invitation to encounter his merciful love through the sacrament of reconcilation. Thank God. I have found all of the above so very helpful. Thank you all.